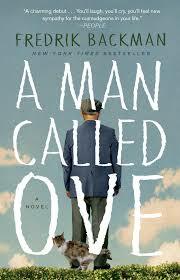 a book chick: "A Man Called Ove"
my take: If we consider that there are only so many plot lines, then I hope you won't take this as a negative: the plot line for Ove falls along the line of the movie Up. I like Up. I cried at Up. Ove is the story of love and death, heartbreak and joy, what's lost and found after great tragedy. It fills out the plot line with a grumpy aged man in a Swedish housing development. Old friends now rivals, new neighbors with weird habits, people breaking the association rules ... the subdivision is going downhill according to Ove. And it's these crazy, weird people who help Ove have purpose and meaning. My only disappointment with the book is that it didn't feel very Swedish. I'd just visited Stockholm before reading the book and was relishing the idea of re-living part of my travels. I think the visuals of a movie would help to get the setting to be particularly Swedish. I see there is a film adaptation and tried to watch a trailer of it on youtube. It's in Swedish with German subtitles. And looks great. Perhaps they'll throw me an English version bone. I laughed, I cried, I came away a better person. I read it. I loved it. I gave it away. I bought another copy. My nephew asked me for a recommendation for a book his mom would love. He bought it. She read it. I see on fb postings that she recommends it to those looking for late summer reads. My book club is reading it for September discussion. It's THAT good!